What’s the difference between an album and a Smart Album in Photoshop Elements 11? Quite simply, an album specifically contains images you choose to add to your album. Any additional images with similar tags, ratings, and other search criteria are not included in the album. A Smart Album starts out with you defining the image criteria you want to include; as you tag or add new files with the same criteria, Elements automatically adds the photos to your album. Say that you have some photos where you add a People tag. You create a Smart Album with the name of the individual you want to add to your album. As you tag additional photos with the same name, Elements automatically adds the new tagged photos to your Smart Album. Make selections for the search criteria in the Search Criteria section. 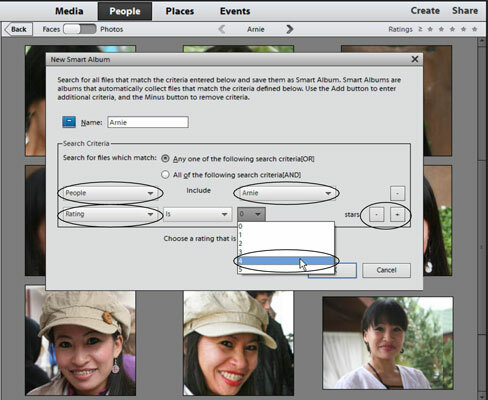 In the example, a new Smart Album is created and the People tag is added, as you see in the figure. The person named Arnie was included for this album, and several photos were tagged with Arnie’s name. If you want to add criteria such as identifying some of the better photos of Arnie, you might add those photos of her that were tagged with four or more stars. After making the criteria selections, click OK. The Smart Album is added to the Import panel. Here’s where the magic begins. As you search through your catalog and find photos of Arnie that haven’t been tagged with a People tag, you can tag the photos. As each photo is tagged with Arnie’s name, the photos are added to the Smart Album automatically. Additionally, if you import new photos and tag some of the photos with Arnie, those new photos are also added to our Smart Album.